The genus Cryptanthus was established by Otto and Dietrich in 1836. The genus belongs to the Bromelioideae and comprises some 25 species, from which several hundred hybrids have been developed. Cryptanthus are prized for their foliage rather than their flowers, which are typically nestled, "hidden," in the center, hence the name: cryptos+anthos (hidden flower). Cryptanthus are terrestrials, indigenous to the dry forests of eastern Brazil. Most grow in shady moist areas, some grow in rocky terrain, a few grow in full sun. They are dependent on their root system for water supply, since they do not store in their centers. A very few ( e.g. C. warasii, C. glaziouii, C. microglaziouii) are succulent and can store water in their leaves. Cryptanthus produce their best color in strong light; however prolon exposure to the sun should be avoided as a general rule. If they begin to redden unnaturally or to bleach light should be reduced. They tolerate low temperatures but their preferred range is 60° F to 80° F. Fertilize during the months of active growth. Pups are produced prolifically from buds at the leaf axils. Pups are often produced even before the plant flowers. Some species produce a mound and pups fall off the top, taking root where they fall. 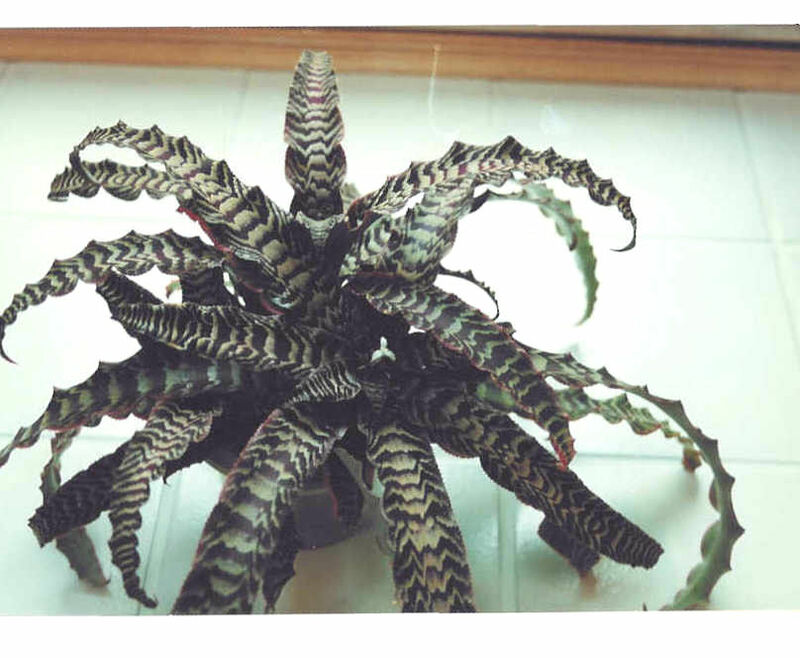 Because Cryptanthus are moisture-loving and not subject to fungal problems.They are excellent plants for terrariums. Rooting the pups is often difficult. They can survive for months without rooting but eventually they must root in order to grow. If they do not root under humid conditions, bottom heat may help. FORM: rosette, usually flat close to the ground but in some species (C.scaposus, C. pseudoscaposus) a short stem is formed which bears flowers at the top. SIZE: from a few inches (C. microglaziouii) to over 3' in diameter. LEAVES: many narrow leaves tapering to a sharp point. A few species have spoon-shaped leaves which have the appearance of being carried on a petiole (leaf stem). Several species have very narrow, even grassy, leaves (C. maritimus). Leaf edges are usually undulated and armed with fme teeth. Leaf undersides covered with scales (trichomes). Leaf Color: green, pink, red, maroon, chestnut, near black. Leaf markings: longitudinal stripes, transverse banding. Leaves of some species are succulent. pseudoscaposus) the inflorescence rises some 6" above the rosette. FLOWERS: three sharply pointed narrow petals, white. Neither showy nor fragrant. FRUITS: seeds are borne in berries. PUPS: grow from the leaf axil and break away readily from the mother plant. A few species bear pups on stolons (runners). C. sinuosus 'Cascade' produces numerous 24-30"stolons, covered with bracts (modified leaves). Leaf color: aurantiacus -orange, carnosus -pink (i.e. meat-colored), fuscus- dark, dusky, viridis -green.